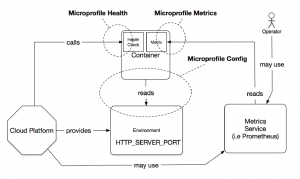 The purpose of this blog post is to provide an overview of the APIs and specifications in the Eclipse Microprofile 1.2 release. 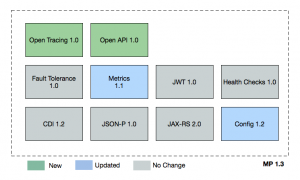 In particular, I’ll try to connect these specifications and APIs with their architectural purpose. Where do they fit and why? 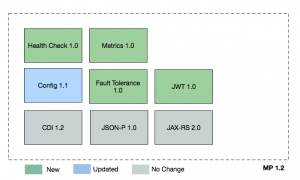 If you’re thinking of moving your Java application to the cloud, then this post might be for you. The first notable thing is the mention of a “software stack”. This stack goes beyond the application level and includes the infrastructure, ways to automate it, and services that orchestrate and schedule computing nodes atop of these layers. 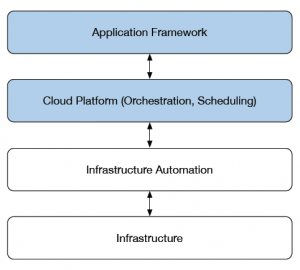 Let’s look at each of those specifications in more detail to explain where they fit in your overall application architecture that sits on a cloud-native computing platform. It’s common and desirable in cloud-native applications that the configuration is separated from the application and maintained by the cloud platform. A common use case for the Configuration API is to bridge between container (hosting your application) and the configuration provided by the cloud platform. 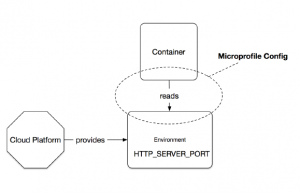 For instance, in this scenario the configuration values are injected into the container at startup (usually environment variables) and consumed by the application through the Microprofile configuration API’s. Now we come to the fun part of distributed systems. It’s 2018, and the network still isn’t reliable (latency, partitioning, etc). But moving to service-oriented architectures leveraging cloud platforms effectively means you are building a distributed system with a lot of network communication. We can address this by introducing failure detection and handling capabilities into our application to deal with this. 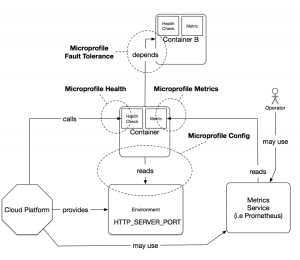 The Microprofile Fault Tolerance Specification sets out to allow this at the application level. It delivers a set of fault handling primitives that you can use to enhance the failure handling in your application and between distributed services. 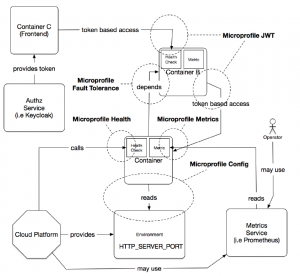 Token based security, as supported by the Microprofile JWT specification, allow you to secure stateless service architectures. It’s based on self-contained tokens issued by an identity management system, like Keycloak. It’s often used with OpenID Connect (OIDC) authentication and leverages JSON Web Tokens underneath. 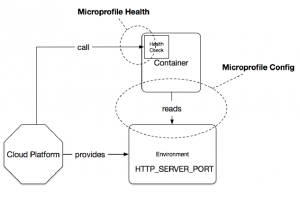 The Microprofile 2.0 on the other hand will focus on integration of the most recent Java EE 8 API’s, to enhance the baseline of the other Microprofile APIs. 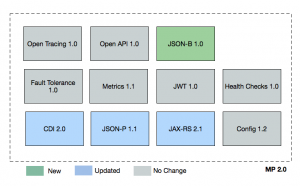 Among these changes are updates to CDI, JAX-RS, and JSON-P APIs, as well as the inclusion of JSON-B, a standard binding layer for converting Java objects to/from JSON messages. To get started implementing microprofile applications and microservices, try the WildFly Swarm runtime in Red Hat OpenShift Application Runtimes. Using the Launch service at developers.redhat.com/launch you can get complete, buildable code, runnable in the cloud on Red Hat OpenShift Online that implements microservices patterns such as health check, circuit breakers, and externalized configuration.